Bubu used to be a sound you could only hear on one day of year, in one very specific part of northern Sierra Leone. 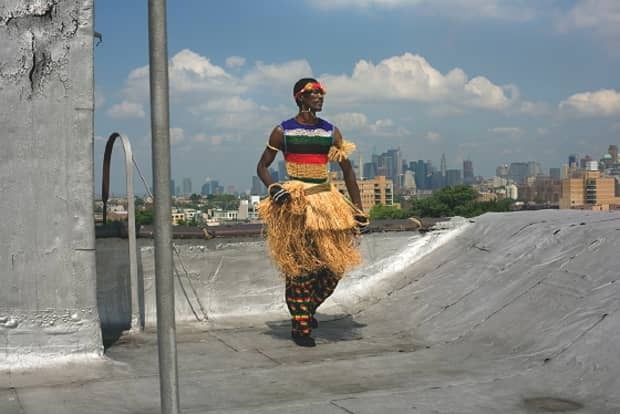 Janka Nabay is the dude that took those traditional beats in to the club, turning up the tempo on talking drums, layering on synthesized melodies and catchy bilingual hooks that fly the flag for a new sense of West African pride. When we spoke to the bubu king last year for FADER 64, he was fresh off playing with The Very Best, busy weaving bigger, more elaborate raffia costumes to impress his newfound fanbase. Nabay was, however, pretty adamant about not recording new material until he was back on his home turf. The fact that he is now disseminating high speed Bubu anthems like this one over the internet, makes us hopeful that he might be persuaded to go into a studio in Philly (where he currently lives), sooner rather than later. Download: Janka Nabay, "Eh Congo"